Celebrating the number 2 in Brittany! 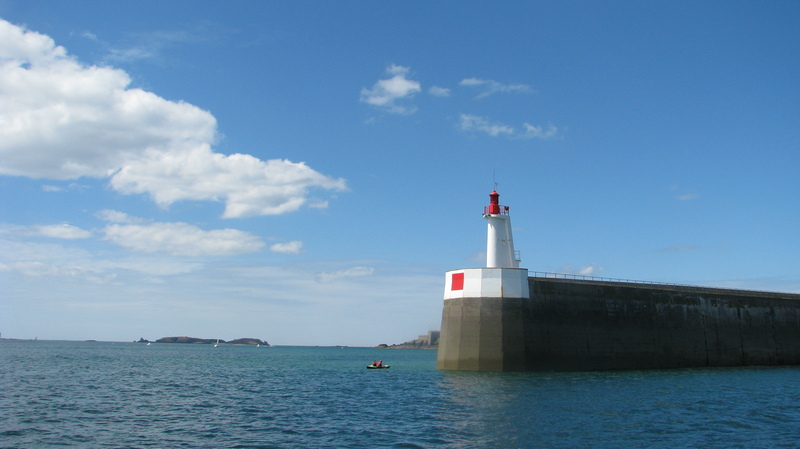 So we are sorry about our silence of recent date – we have been enjoying some amazing weather in Brittany and have been too busy cycling to blog. Unfortunately this all came to an end about a week ago when the heavens opened and we (with the exception of Amaya) were significantly drenched. 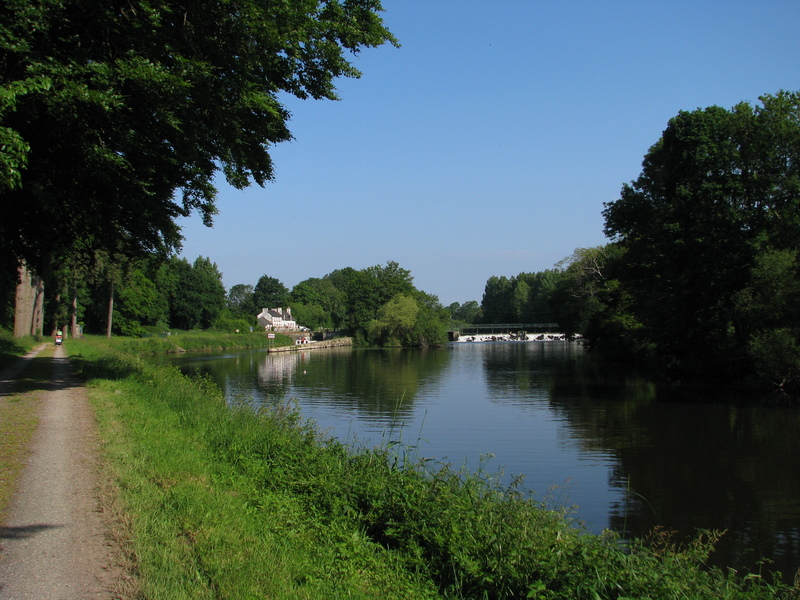 Since the mechanical elephant of Nantes we followed a stunning canal deep into Brittany. We passed castles built into cliff faces with witches hat turrets, enjoyed coffee in ancient town squares, camped in a forest where legends of King Arthur are told, scoffed crepes, wound our way along the flat tow path of the canal, passing river barges going up the locks, and cherishing the car free environment with the birds providing the soundtrack. An amazing castle in a city called Joselyn along the Nantes-Brest canal. 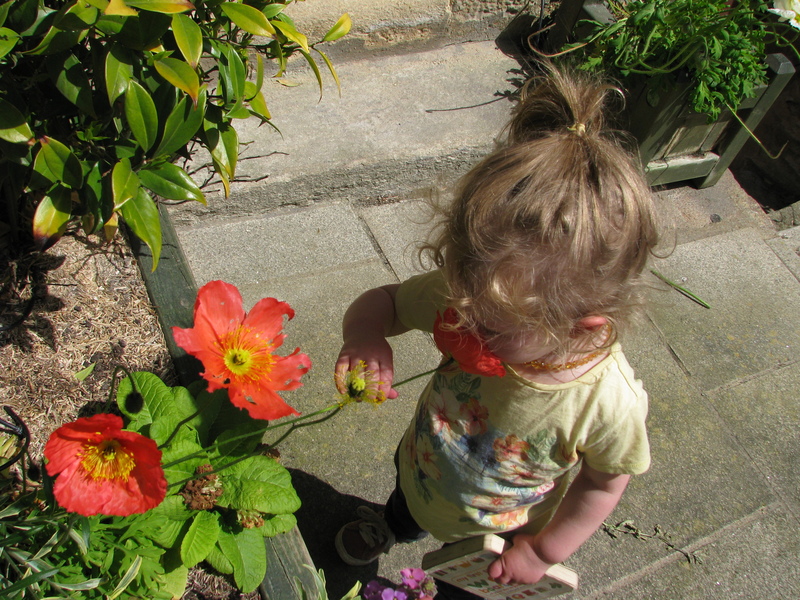 She is really burying her nose into that flower! 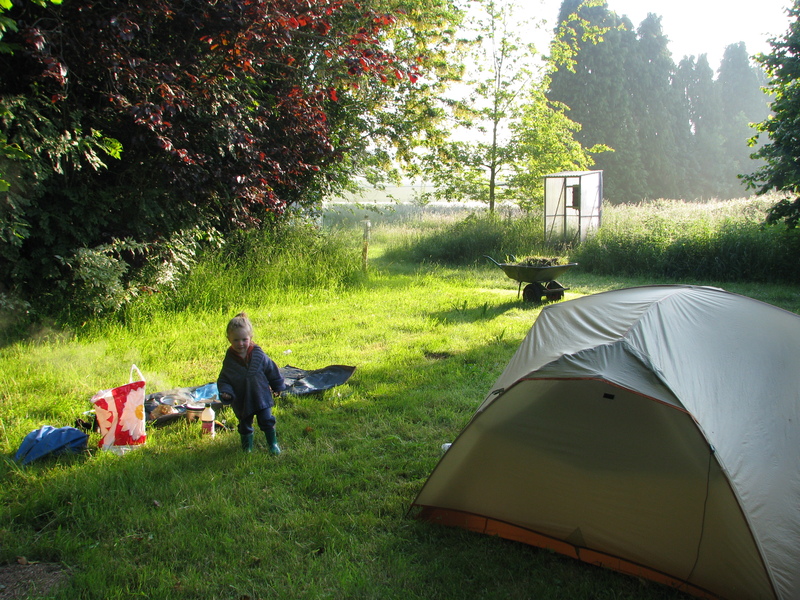 This was a cool campground in an old guys backyard – total cost of 3.80 Euros! Meanwhile there have been a few causes for celebration: Amaya’s second two-year-old molar finally poked through, her age caught up to her teeth on the 15th, it has been two months on the road, we made it to Roscoff which marked the end of our 1300km cycle path that we had been following since entering France, and we passed 2000km! Sometimes we even find it hard to believe that we have managed all of this through simple pedal power! That we have actually transported ourselves from Barcelona to Brittany on bicycles!?!?! 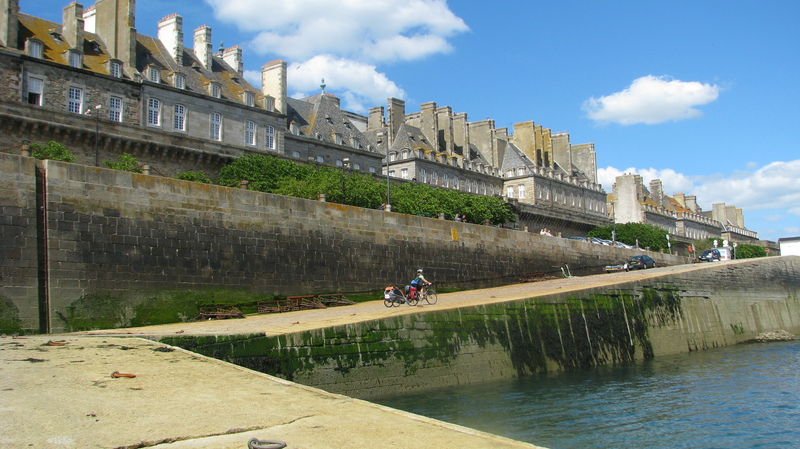 Excited to have made it all the way to Roscoff on our 1300km cycle path. We are now in St Malo where we are catching a ferry to Portsmouth and then visiting Jonny (Shoshanna’s brother) and Helen and their new baby, Henry in London. 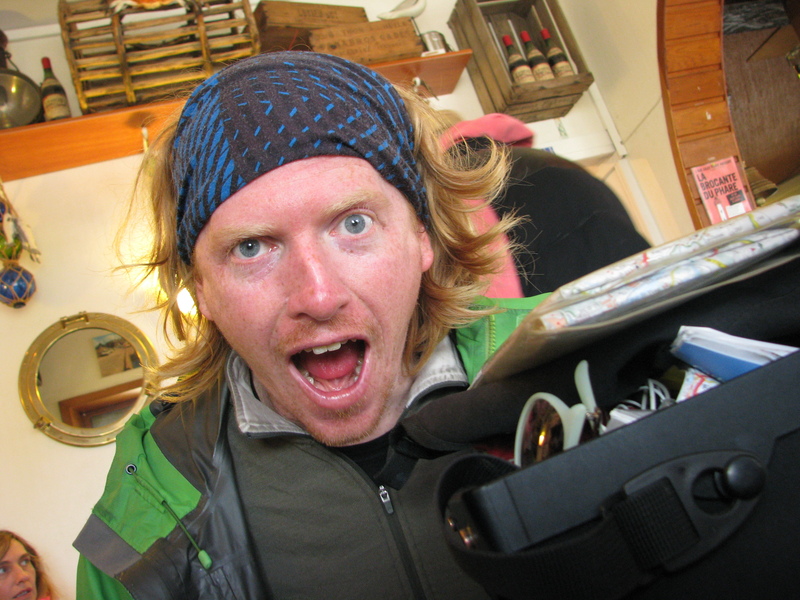 We then make our way back onto the continent and meet up with my parents and ride through Belgium and Holland for a few weeks and then up into Germany and the Baltic Sea and down to Berlin. Fortunately there is a lot of cycling ahead of us. 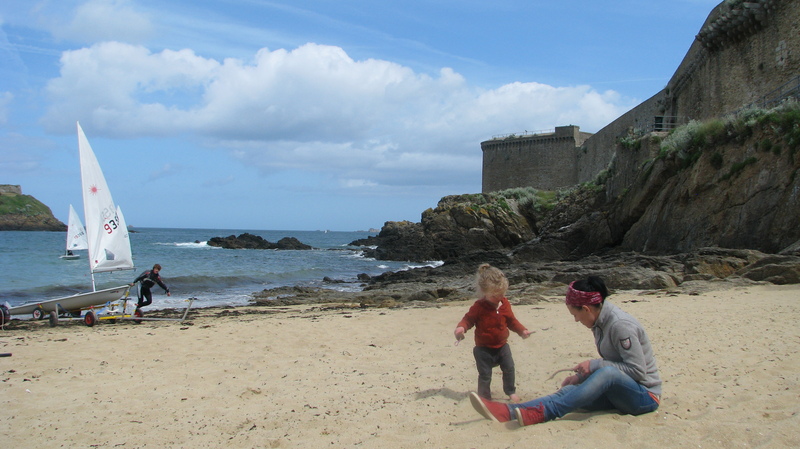 We played for hours on the beach with the fortified city of St Malo all around us. 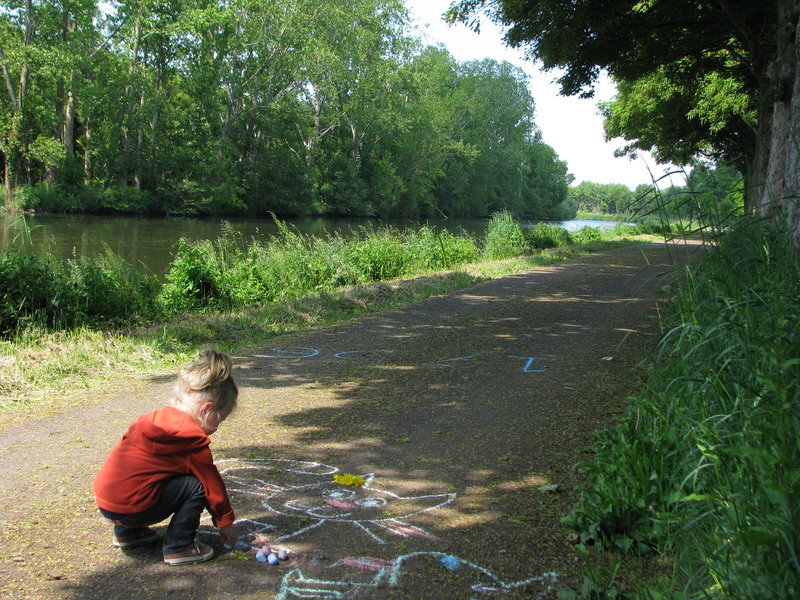 This entry was posted in Barcelona to the Baltic and tagged Bicycle Touring, Cycle touring with a baby, Cycle touring with children, cycle touring with kids, Cycling Brittany, cycling Nantes-Brest canal, France by babyonabike. Bookmark the permalink. Congratulations on the 2000 kms. It is amazing that you have gone so far already. We were in Brittany last year, you are right. It is lovely. Take care!!! Hey Albert! Indeed it is hard to believe that we basically began our journey at your place! Doesn’t seem that long ago. You were right about the villages being stunning! Thanks Liz and Andrew! Hope all is going ok with you both! We miss you as well! Man, you guys travelling like this with little Amaya is so inspiring! Brittany looks stunning too. Thanks guys – we will have to check out your blog as well – from talking to Ben and Chloe it seems like we have just missed each other. You still in Europe? Yeh we did just miss you. We were in Biarritz and Hossegor in May. Spewin. We are in Montenegro now, making our way up the coast. Keep enjoying!! Yeah Shosh hid it really well when we met up! 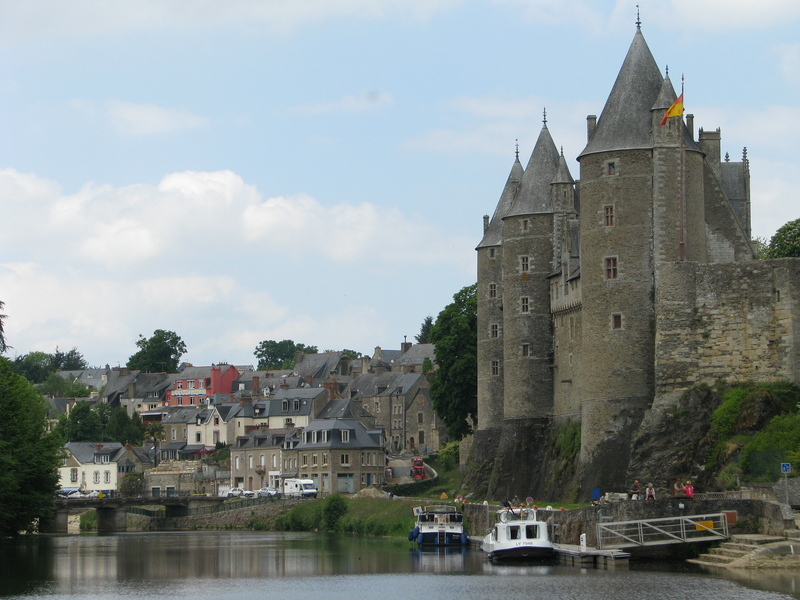 Yes we did go to Dinan and loved it – easily rivals St Malo but is not as famous. Glad you are enjoying reading our blog! Hope you and your family are well! Thanks Susan! When it’s tough it helps to know that we are changing lives! Just survived some harrowing cycling in the centre of London! You guys are so inspiring! Well done on reaching the 2000km mark – have been reading each of your posts with such interest. Take care and enjoy the time coming up with extended family! Thanks for your support and encouragement! Super glad you are reading our blog! These pics are stunning, guys… Published book material one day? All the best for in the UK. 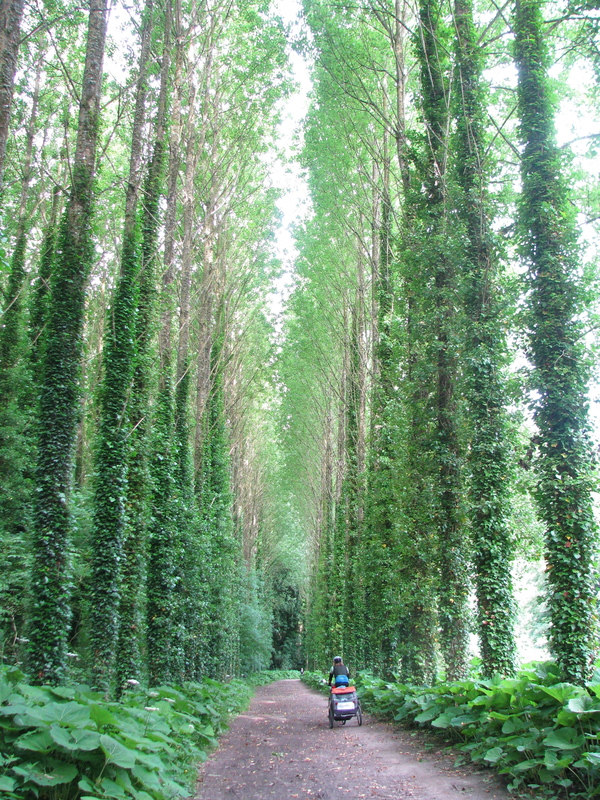 Not sure that the biking will be so good – or scenic! there. Thanks Colleen. We are in London now. Had a pretty hairy ride across the centre of London. Won’t be doing too much cycling here though as we are keen to maximise our time with Jonny and Helen and then get back on the continent.